The Catherine Houard Gallery located in the heart of the historic Saint-Germain-des-Prés strives to be resolutely multidisciplinary. The gallery presents renowned artists from different universes and artistic movements, whether contemporary or modern, with work either devoted to painting, drawing, printmaking, sculpture, ceramics, photography or everything at once …! 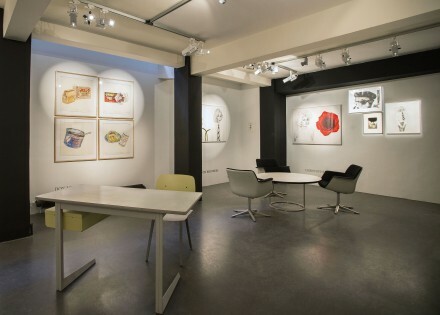 The gallery is also interested in the personal work of personalities from the world of fashion, Sonia Rykiel and her drawings, from the Cinema, Dean Tavoularis or Ettore Scola, from the theatre and the medias, Jerome Revon, Jean Feldman … It seeks to build bridges between different genres. Catherine Houard also introduces pieces of furniture designers and architects, including industrial furnitures from the «Dutch Prouvé», designer Friso Kramer. Much more than an art gallery, Catherine Houard wants a friendly, warm and welcoming space, where passions meet each other, a place open to all, where multiple universes as poetic as eclectic can be told, but still resolutely artistic. – «American Indian Art», until January 9, 2016. – «The Hugo, An Artist Family», in April 2016. – Fédération Française des Galeries d’art photographique (FFGAP). The Gallery is on Social Media : Facebook, Twitter, Instagram, Linkedin.